One Ingredient Gives This Tasty Soup Some Extra Spice! 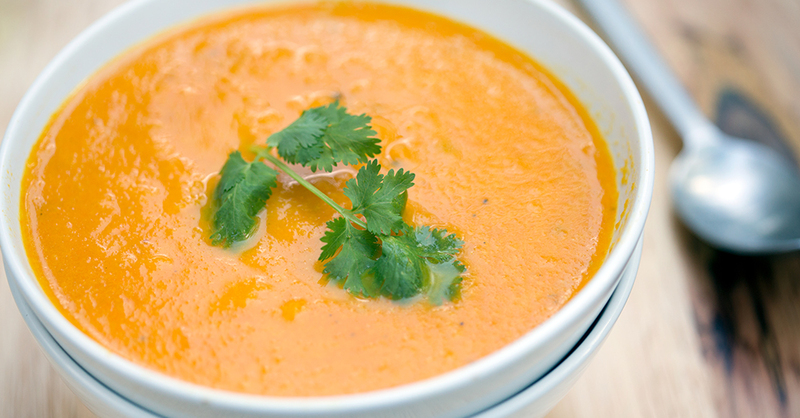 If it’s just been one of those days or the weather has turned ugly outside, you can enjoy a bowl of comfort with this carrot ginger soup. This is the grown-up version of your mom’s vegetable soup you loved as a child with a kick of ginger to spice up your day; one of the best parts of this dish is the ability to amp up or lower the spiciness by adjusting how much ginger you add. After whipping up a batch, simply serve with your favorite crackers or a loaf of fresh bread…this is a great dinner and your family will love the sweet and slightly spicy flavor! Heat 1/2 cup vegetable broth on medium heat in medium saucepan. Add onion and garlic and cook for 6-8 minutes, stirring occasionally until tender. While stirring, add ginger, carrots, potato cubes and remaining broth to saucepan. Bring to a boil and then reduce to simmer, cover and cook for 25-30 minutes, or until vegetables are tender. Using a blender or food processor, carefully puree mixture in small batches until desired consistency is reached. Add broth or water to make soup thinner, if desired. Return soup to stove and add lemon juice. Cook for 2 minutes, then transfer to serving bowls and garnish with fresh cilantro.